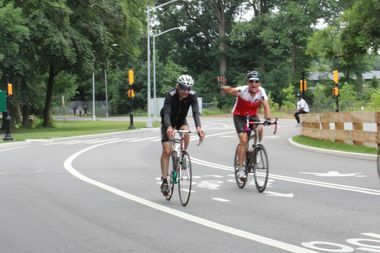 Bicyclists wave as they ride on East Drive in Prospect Park. Starting next week, cars will be banned completely from all roadways inside the park. PROSPECT PARK — Starting next week, cars will be completely banned in Prospect Park for a two-month test period, the city announced Monday. Beginning July 17, the trial run of the car-free park will begin, the mayor and Department of Transportation officials said, extending a car ban that has been in effect on the west side of the park since 2015. Currently, cars are allowed only on the park’s northbound East Drive between rush hour, from 7 and 9 a.m. But that will change between when the entirety of Prospect Park’s roadways will be open to pedestrians and cyclists only, the agency said. “Cyclists, joggers and pedestrians, young and old, can rejoice during these next couple warmer months in a safer and quieter park,” said DOT Commissioner Polly Trottenberg in a statement Monday. City officials said they arrived at the decision after receiving many requests from the community and local officials to expand the car ban from the West Drive to the entire park, particularly in the summer. When the West Drive ban was first announced, many residents on the park’s east side fumed they were left out of the new policy. Additionally, statistics show low usage of the drive by cars. Fewer than 300 vehicles use the East Drive during a morning hour in summertime, according to DOT numbers, while nearly 1,000 pedestrians, runners and cyclist use the road at the same time. The DOT said it will use the two-month, car-free period to study how the closure of the East Drive affects northbound traffic on city streets adjacent to the park. However, there are currently no concrete plans to extend the East Drive traffic ban past September 11, the DOT said. "We will evaluate and determine next steps based on the results of Prospect Park’s first car-free summer," said Alana Morales, spokeswoman for the agency.